With the promise by the previous Labour Governments’ introduction of the National Broadband Network (NBN) being finally met, requests for Hire of small ‘Slim-line Trenchers’ are on the increase. 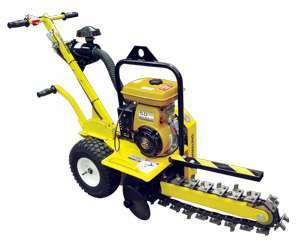 Crommelins have three models, with the most popular as the 12” Groundhog T4 Trencher being requested. All featuring a slim design, petrol Subaru powered engine with 3 year engine warranty, 2 year manufacturer’s warranty and lifting hooks for transport. The Groundhog Trenchers are operator propelled to offer controlled digging at the exact depth with minimal effort and their slim design allows digging close to walls and fences. A narrow width of 610mm allows them to fit down narrow paths and doorways. Extra features include a front roller to increase the Digging Chain lifespan a side cleaning auger to stop material falling back in the trench, guards and safety rails to prevent injury and soft pneumatic wheels.